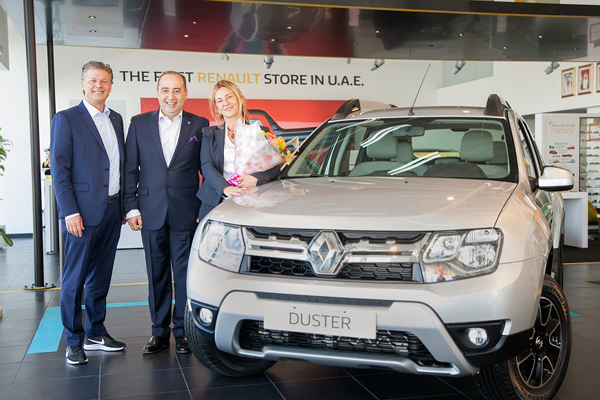 Arabian Automobiles, the flagship company of the AW Rostamani Group and the exclusive dealer for Renault in Dubai, Sharjah and the Northern Emirates, has celebrated the sale of its 10,000th Renault Duster across its network of showrooms. Italian customer Stefano Bassanese purchased the vehicle as a gift for his wife Lorena Severi, a World Champion Hairdresser who has been awarded the title of ‘Picasso of Hairstyling’, said a statement. The Renault Duster is as equipped for day-to-day life as it is for adventure, with its robust design or heading off the beaten track with its all-terrain capabilities, the company said. The ride is enhanced by advanced technology including cruise control, anti-locking braking system (ABS) and an electronic stability program (ESP) for safe travels for the passengers and pedestrians, coupled with an intuitive 4WD technology, unique to its segment, offers ground clearance by adapting to the road conditions.